I recently decided to give up caffeine, completely! No tea, nothing. I definitely made the mistake of not having GREAT alternatives on hand when I went cold turkey, and it was not a fun few days, but I'm on the other side of it and have discovered some fabulous alternatives during my experience! To me, a warm morning drink is part of my ritual. I wake up, make my drink, and meditate. Not having a warm beverage that I LOVE the taste of, was really throwing me off. So I took the challenge to find several options that hit the spot. All of these have been taste tested + approved by me! It's important to note that small amounts of caffeine aren't bad for everyone. For me, I could tell I needed to detox my body from caffeine, and that it was negatively affecting my hormones + stress...time for a re set! Read below for my top 3 caffeine replacements, try them out, and let me know what you think! Ok guys, I've been wanting a reason to try this stuff for a long time! Morning, or night, this blend is fabulous, combining the health benefits of reishi mushrooms with yummy cacao. Yes, it does taste similar to hot cocoa...not quite as sweet, but still delicious. This has become my go-to morning drink! Browse their website to discover all the different blends they offer! If you're just looking to lower your overall caffeine intake, they have great coffee blends, too! If you're used to brewing a traditional cup of morning coffee, this may be the stuff for you! 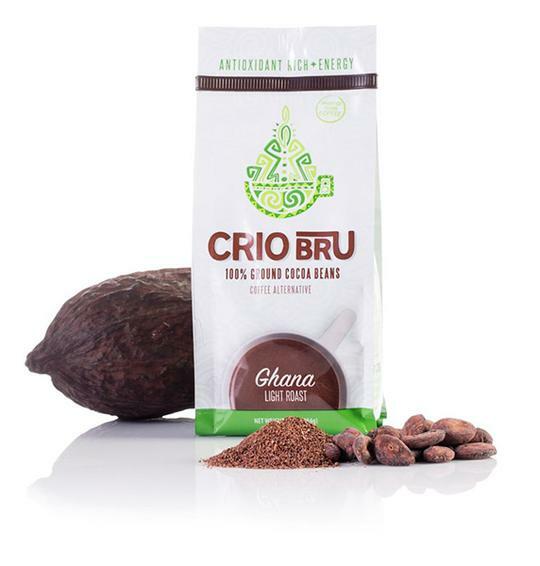 100% ground cocoa beans in a variety of roasts and flavors, this is a great caffeine-free alternative, without having to change your habits or lifestyle, at all! 2 thumbs up! Teeccino herbal coffees have the rich flavor of coffee with the benefits of herbal tea. There is a very robust flavor, similar to coffee, but the energy boost comes from the herbal nutrients, not stimulants. Designed with the intention of helping consumers to wean off of caffeine, this is truly a great substitute! Available in loose ground or tea bags, and in a wide variety of flavors. I hope these tips help you to find some fabulous alternatives, when you're looking for a delicious way to either cut out or cut down on caffeine. Do you have a caffeine alternative drink that you love! Leave it in the comments below, I'd love to know!